Fr. Edward Rommen is the priest at Holy Transfiguration Orthodox Church (OCA) in the Raleigh-Durham area of North Carolina. 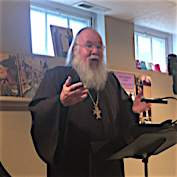 He gave a series of talks on Evangelism at Holy Transfiguration Antiochian Orthodox Church in Warrenville, IL, on December 12, 2015. Our thanks to Fr. Wilbur Ellsworth for allowing us to come and record. In his homily at Great Vespers, Fr. Edward Rommen uses the teaching of St. Theophan the Recluse in his book, Unseen Warfare, to apply our spiritual disciplines to the work of evangelism. Fr. Edward Rommen talks about the practical factors involved in having a conversation about spiritual things. Fr. Edward Rommen tells us how our own spiritual development enables us to be a credible witness. Fr. Edward Rommen talks about the strong place the Church and its Liturgical life plays in our life in Christ. Fr. Edward Rommen's first talk is about the personal and experiential nature of our life in Christ as Orthodox Christians.